There are almost twice as many U.S. troops in Afghanistan now as when Barack Obama became president. We're still spending over $10 million every hour (even during a government shutdown) for a war in Afghanistan that has now completed its 12th year and entered its 13th. This spending drains rather than fuels the U.S. economy. President Obama is trying to negotiate an agreement with corrupt lame-duck President Hamid Karzai to keep some U.S. troops in Afghanistan indefinitely, with immunity from prosecution for crimes and the right to continue attacking Afghans including with raids on their homes at night. This could mean nine major U.S. military bases remaining in Afghanistan at a huge cost in dollars, lives, safety, and environmental destruction for decades to come. If you are not in the U.S. please click here. Afghanistan needs humanitarian aid, not a 13th year of U.S. war. As a constituent, I urge you to stand up for: No permanent bases. No "drawdown" going on and on. An end to the U.S. war in Afghanistan. 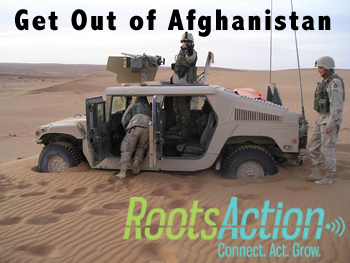 Bringing home all the U.S. troops and military contractors!